Boston is a cosmopolitan city with character, and offers direct access to the breathtaking natural beauty of New England. The capital of the state of Massachusetts has about 620.000 inhabitants, is located on the east coast of the US and is one of the most culturally interesting cities in the country. 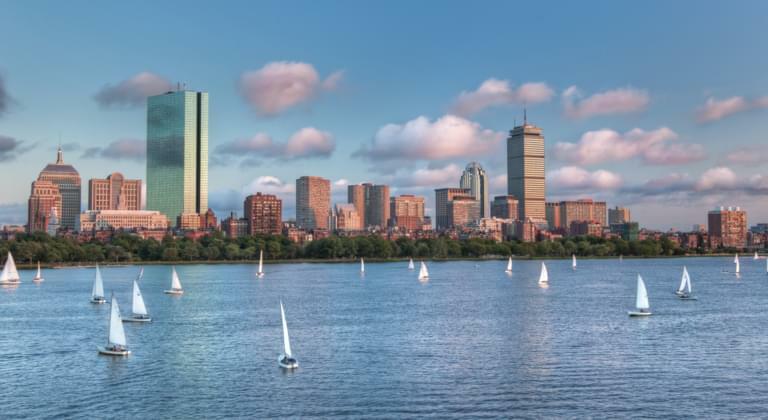 Boston is not only home to world renowned universities such as MIT and Harvard, but is also one of the wealthiest and most traditional cities in the United States. Hiring a rental car opens up limitless possibilities for discovering the city and the whole state! What should I know before renting a car in Boston? Boston is a busy and large metropolis with a wide range of car rental companies. It is best to search in advance for suitable providers and models at Driveboo, compare the offers and book your dream car - this will save you lots of time and stress upon your arrival. Driveboo will help you determine the best deal for you. When reserving a rental car, you need to know the acceptable age and number of drivers, what insurance conditions apply and what happens in the event of damage. For example, some car rental companies do not rent - or do so only for an extra charge - to drivers under the age of 25. In addition, the insurance cost may vary. A direct comparison with Driveboo can therefore make your life easier and save you time. What traffic rules apply in Boston? Overall, driving a car in the US is pretty relaxed and the driving style of Americans is not significantly different from that of Europeans. However, you should keep an eye out for speed limits and familiarise yourself with local signage so that you're always safe. Using your phone at the wheel is a punishable offence! Fun fact: It's forbidden by the law of the state of Massachusetts to carry a gorilla in the back of your car. Logan International Airport (BOS) is located just a few minutes away from the city centre. With more than 30 million passengers a year, Boston Airport is one of the most important airports in the country. At Boston Airport you will find a large selection of rental car companies. This means you can drive straight out of the airport and start exploring immediately. Use your rental car to explore as much of the city and beautiful New England as possible - Boston and its surrounding areas have so much to offer! In Boston, you'll be spoiled with an abundance of imposing buildings, countless museums, art galleries, exciting restaurants and attractive destinations around the city. Depending on the season, the possibilities vary. Simply decide on your rental car and you're free to explore as you please. The Freedom Trail takes visitors along a marked path that passes through major locations significant to the history of the country. Follow the trail and discover 16 unique and fascinating sites, starting at Boston Common and finishing at Bunker Hill Monument. Sports fans should pay a visit to legendary Fenway Park, home of the US Major League Baseball team, the Boston Red Sox. The stadium was built in 1912 and has hosted numerous world-famous games. A baseball game in this historic setting is a special experience for anyone, not just avid sports fans. The historic indoor market of Faneuil Hall is also well worth a visit. It is one of the oldest buildings in the state of Massachusetts and is located near the harbour. Extensive dining options, eclectic shopping and a variety of events in an historic setting make Faneuil Hall a must-visit destination. Boston also has an extensive list of interesting museums. The Museum of Fine Arts, the John F. Kennedy Presidential Museum and The Paul Revere House are just some of the most popular. If you prefer your cultural attractions a little more unusual, you might want to take in the Boston Beer Museum or the Mapparium - an impressive three-story globe-like room imitating a world map. Throughout the year, many interesting events take place in Boston. Movie fans will get their money's worth at the Boston Science Fiction Film Festival in February, or at the Arlington International Film Festival in October. The First Night event in December offers a varied New Year's Eve spectacle. Bold Bostonians and visitors spend New Year's Day taking part in the L Street Brownies Swim - an annual swim in the ice-cold Boston Harbor. The city also hosts a range of ethnic and cultural festivals. If you want to find out about current events, concerts, theatre performances and sporting events, have a look at the various event calendars in the city. Boston is located in the idyllic surroundings of New England, directly on the Atlantic coast. Make the most of your rental car and explore the Boston area and the stunning east coast. If you rent a car, all roads are open for you to discover! Nature lovers will appreciate the proximity to the open sea, and can take a trip to the coast to look for whales. The Stellwagen Bank is the most famous whale watching station on the east coast of the USA and is visited by humpback, fin and minke whales. To observe the giant mammals up close is pure adventure, and surely an unforgettable experience! If you simply want to enjoy beautiful views of Boston's skyline from the ocean, you can choose between various boat tours. How about a day trip to Martha's Vineyard? This beautiful island situated south of Boston invites visitors to discover its many delights. You can park your rental car in Falmouth before you continue your journey by ferry. Here, you can discover the idyllic villages on your own or as part of a guided tour, marvel at the rough cliffs or simply spend time on the magnificent beach. Numerous cosy cafes and restaurants offer you an extensive culinary adventure.